As you undoubtedly know, you're supposed keep your files backed up, your applications up-to-date, and your antivirus software current. Unfortunately, you are--to speak frankly--too lazy to do these tasks as thoroughly and regularly as you should, and too cheap to shell out for add-ons that would do it for you automatically. How do I know? Because...we have a lot in common. But we don't have to reinvent ourselves to get things under control. Here are a few tricks you can use to keep up on your basic PC maintenance without breaking a sweat. 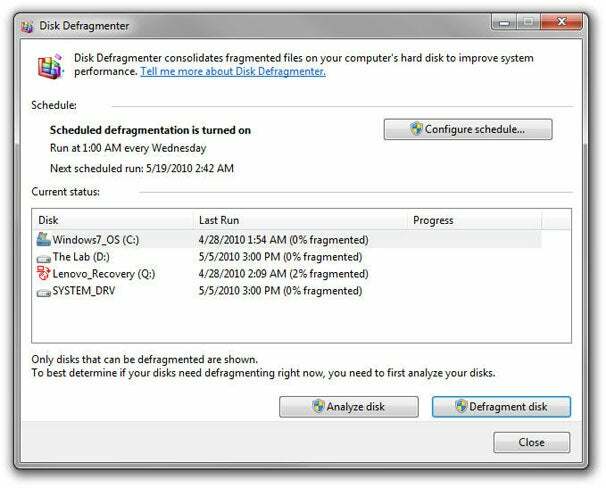 Disk Defragmenter will automatically handle your Windows disk defragging. If you still use Windows XP, your operating system expects you to perform a few more maintenance tasks than later Windows versions do. Defragmenting your hard drive, for instance, is automatically scheduled in Windows 7 and Vista but has to be done manually in XP (right-click the drive name in My Computer, select Properties, Tools, and choose Defragment Now). Regrettably, Windows 7 isn't free--Home Edition costs $100 at this writing--and though it's the best Microsoft OS I've ever used, it might be out of your price range. Also, if you're on an older PC, slogging through the upgrade process might not be worth it (though we have plenty of Windows 7 upgrade tips if you want to give it a shot). On the other hand, defragmenting a 1TB hard drive doesn't yield the same performance benefits that performing the same operation on a smaller, slower hard drive used to provide--and those performance benefits were fairly minor to begin with. So, assuming your PC is recent enough to read this article, you'll probably be okay putting off defragging. Dropbox: The lazy way to back up your data. We have plenty of great how-to articles explaining different backup strategies and backup plans; but if external drives and thoughts of drive images make your eyes glaze over, they won't help. Instead, think about what you have on your PC that you'd miss if you lost it. For example, if you have irreplaceable photos on your PC that you need to back up, but you don't want to spend the time or money required to back them up to a DVD or external drive, consider storing them in a Flickr account, a Picasa Web album, or even a Facebook album. All of those options are free (though some services will charge for storage or monthly upload bandwidth beyond a specified limit), and they all have auto-upload functions to keep your photo backups going. Picasa users can do this automatically with Picasa Web Albums, while Flickr and Facebook users should check out Foldr Monitr for Flickr and LiveUpload to Facebook. When it comes to documents, the main items I want to back up are my work-related documents (old article drafts, mostly), so I don't need to buy terabytes of storage. In fact, I don't even need to buy a USB flash drive. I simply signed up for a Dropbox Basic account--which gives users 2GB of free online storage--and copied my whole Work Stuff folder over to it. That doesn't always work, however, because I have a handful of high-res image files scattered among the Word docs, and they would eventually use up all of the space in my free Dropbox account. Rather that shell out $10 a month or so to increase my space allotment, I periodically do a quick search for every Word file on my hard drive (by searching for *.doc) and drag the files into a new folder on Dropbox. 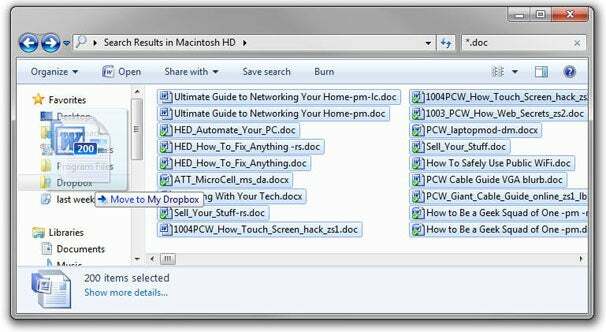 If you have other folders on your hard drive that you want to sync with Dropbox without relocating it, simply grab Dropbox Folder Sync. Also, since Windows treats Dropbox as it would any other folder in its file system, you could create a batch file with some basic DOS commands to automate that search and copy process.